Readers will already gather that this is not a serious blog. But it is a wet Sunday and hey ho. While strolling with Mel the Collie, I spotted that a sign has been erected on the Foldgate Lane housing development site in recent days. After a small diversion and modest trespassing, I gained a rather award photo. St Laurence View? 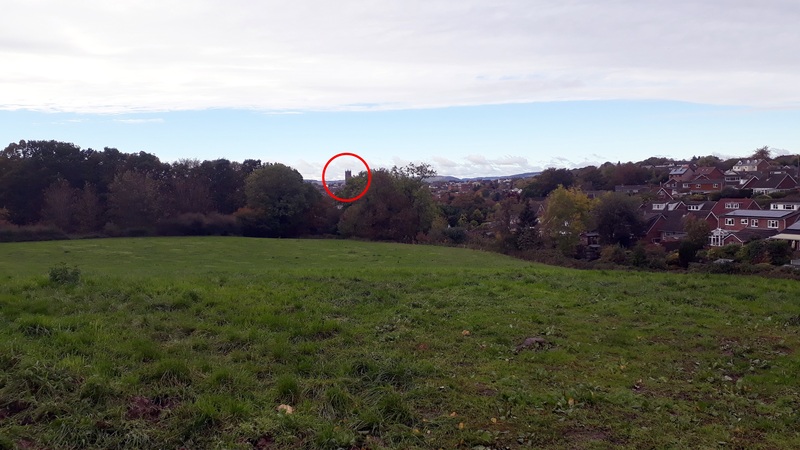 Okay, part of the site looks out to St Laurence’s Church as shown below. But this is not a view towards St Laurence. He was a Roman and is buried in Rome – that’s a thousand miles in the opposite direction. It is a view towards St Laurence’s Church. But there is that awkward apostrophe to deal with. We can imagine the boardroom debate that must have occurred in Crest Nicolson. Oh dear. Soon we will be stripping the apostrophes from Bishop’s Castle and Richard’s Castle. We could become an apostrophe free county and country. I am sure that civil servants are already arguing that all apostrophes will be lost if we crash out of the European Union without a deal. The CBI is bound to declare that businesses will save billions if the apostrophe is abolished. Fired up by Lynne Truss, towns and cities across the country will fly apostrophe shaped blimps to protest at the loss of one of the most important parts of our language. Before the expected apostrophe riots, St Laurence’s Church is to hold a beer festival next weekend. It comes complete with an apostrophe, a free glass and a few pews to collapse on when overwhelmed by the beauty of the church (or other influences). This is called “The Ale Wife Beer Fest”. That’s so retro. I am old enough to remember “ale wives” in parlour pubs. They were often slaves to their businesses which provided them with a home. But I look forward to seeing Kelvin Price and Shaun Ward in dresses, pinnies and sporting a grumpy frown. 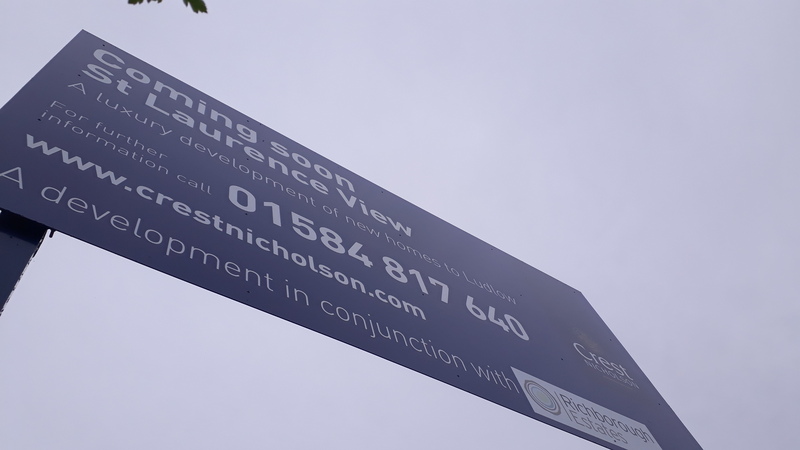 If we are to lose the apostrophe in housing developments that reference St Laurence’s, surely it is time to modernise the language of the church. Maybe replace the Ale Wife with Ale Husband next year? Or better still, “St Larry’s Beer Up”? I’d sign up for that. Providing it has an apostrophe. I can now reveal that I was once a member of the SAS. Apostrophes can give rise to problems even when they are used properly (e.g. ‘The Times’ ‘s). They are typically used for possession but can also be used for attribution (e.g. Constable’s painting ‘The Hay Wain’). But adjectival nouns are also respectable usage (e.g. science teacher) so “The Constable painting ‘The Hay Wain'” is OK too, as are a number of existing uses of this form in Ludlow (Clee View, Downton View, Hayton View etc.) I don’t think anyone is suggesting that St Laurence owns the church so it is an attributive use for which the form Church of St Laurence/St Laurence’s Church is merely a customary form. Were the Church called Holy Trinity no-one would complain about ‘Holy Trinity View’. So I say let adjectival nouns be. Could the same level of learned discussion be applied to repairing the Towns wall / wall of the town. I’m sure it could. But I shan’t be holding my breath. Fortunately the building blocks of the English language are free.